Just because a deck has a C/O doesn’t necessarily mean it’s safe. I came across this situation with a young couple buying their first home in Bedford. The first question any good Agent asks is ‘Does the Deck have a C/O’? In this case the answer was yes so I thought there wouldn’t be a problem – not so. This home was a weekend home for an older couple from Manhattan. They owned the home for over 30 years and when the deck was built it was built to code however, since that time building codes have changed and for good reason. Looking at the Deck you would never suspect the Deck was dangerous as it was well taken care of and the wood was in good shape (the couple rarely used the deck so there was not much wear and tear). On closer inspection things popped up like the railings. This Deck was built when horizontal railings and built-in deck seating was popular. This is a big no/no since kids can climb onto the built-in seats and over the rail. Handrails have to be at least 36’’ high (check with your local building codes) and the space in between spokes can be no larger than 4’’ (so kids and pets can’t get their heads stuck). 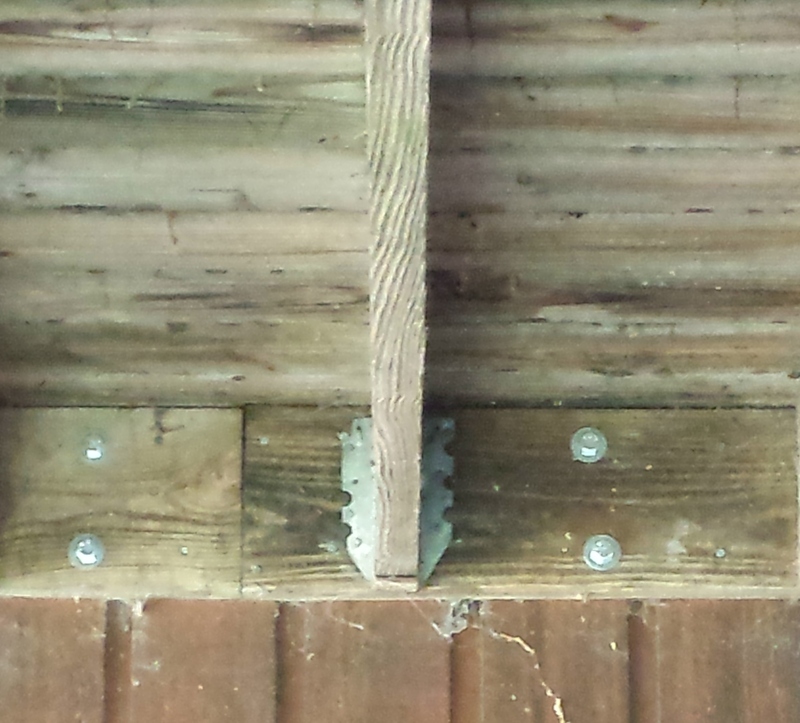 The deck should be ‘bolted’ to the house, not screwed with deck screws or nails. If it is not bolted it can separate and pull away from the house. You need to use ½ inch stainless Steel or Galvanized Lag Screws. 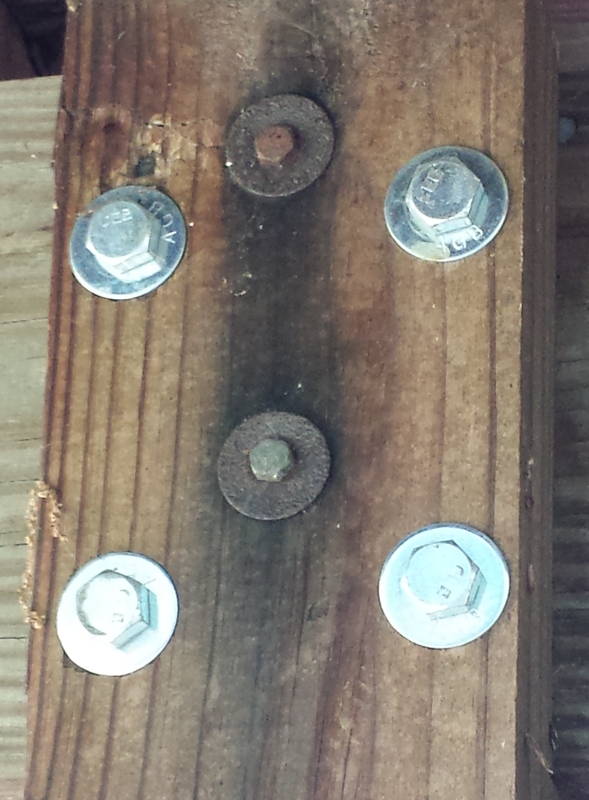 If the Screws are not large enough they won’t be able to support the Deck. If they aren’t Stainless Steel or Galvanized they can rust and become weak. The Posts that support the deck need to be placed on footings and not buried beneath the ground. 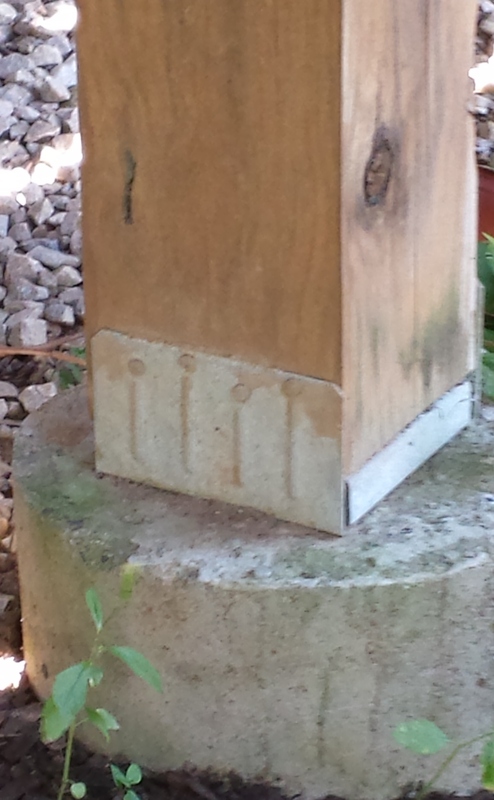 The posts should also never sit directly on top of the concrete footing (wood should never come in direct contact with concrete) it should be anchored to the footing with a metal anchor. 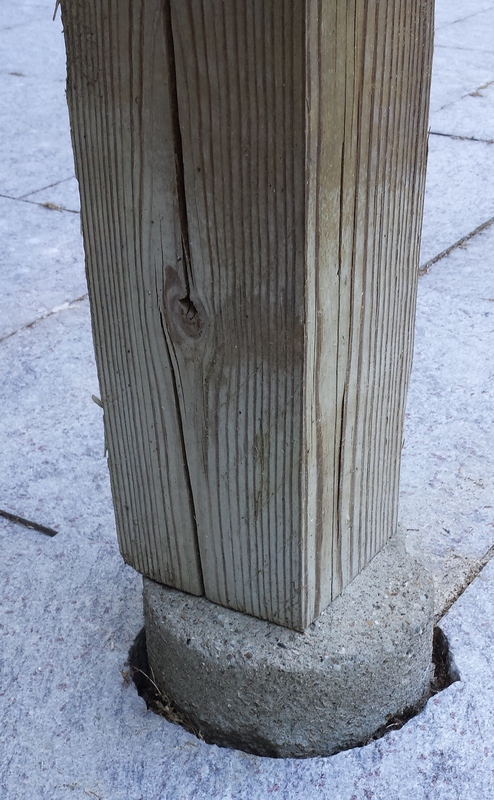 Footings need to be larger than the post and the post should sit in the center of the footing – the footing in this picture is too small and the post is not anchored. Another thing to look for is flashing,this can be overlooked but is important. Flashing is located between the deck and house.It protects the house from water.moisture and helps prevent rotting.Proper maintenance and yearly inspection of your deck will help it last a long,long time.